Content marketing has evolved faster than anyone could have anticipated. These days, there are so many options vying for people’s attention, with more than 2.5 million new posts being uploaded every day, covering virtually any topic. If you want to stand out in that flood, you need to create great, resonant content which connects with your audience’s key interests, and while hiring professional writers is definitely a great way to ensure the grammatical quality and readability of your blog, for true insights, you also need to showcase your professional expertise in your niche. 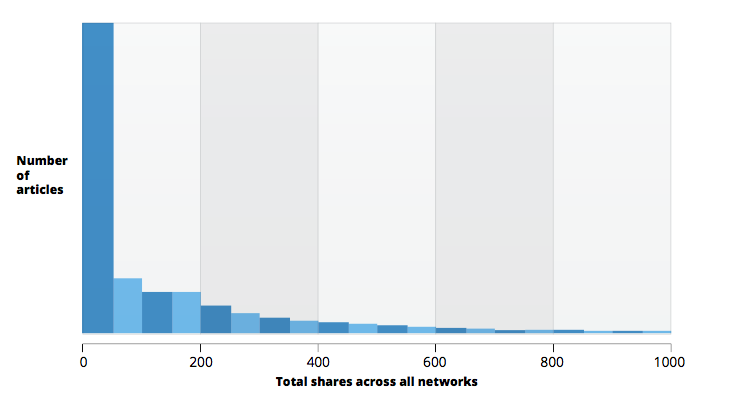 A recent study from Buzzsumo highlights the problem – they found that almost three-quarters of all articles receive 39 shares or fewer. People only share stuff that helps make them look good, or which provides the exact insight they need. Hiring professional “generalist” content writers to generate all your content won’t always cut it – if you want to publish something that’ll resonate with engineers, for example, then you’re going to need some significant input from an engineer. Some content can still be written by versatile, talented freelance article writers – I almost always hire professional writers to generate the sales copy and landing page content that my clients need, and it performs well. However, when it comes to creating immersive, long-form reads that draw massive shares via social media, you’re better off utilizing subject experts to boost your messaging. Subject matter experts are highly knowledgeable about their fields – but that, of course, doesn’t mean that they can write effectively. Some professionals write extensively as part of their professional career, so they can generally be trusted to write engaging articles, however, some niche experts haven’t written 500 words of prose since they left high school. Even if a subject matter expert isn’t proficient as a writer, they can still be involved in the content generation process. A professional writer can help guide them – the writer can solicit their input on the issues that matter to niche practitioners, important terminology, industry slang and humor that people in their field share with each other. They can collaborate remotely to merge their words to make it feel like an insider wrote the whole thing. Here are three tools that can assist with content collaboration – both within your organization and elsewhere. 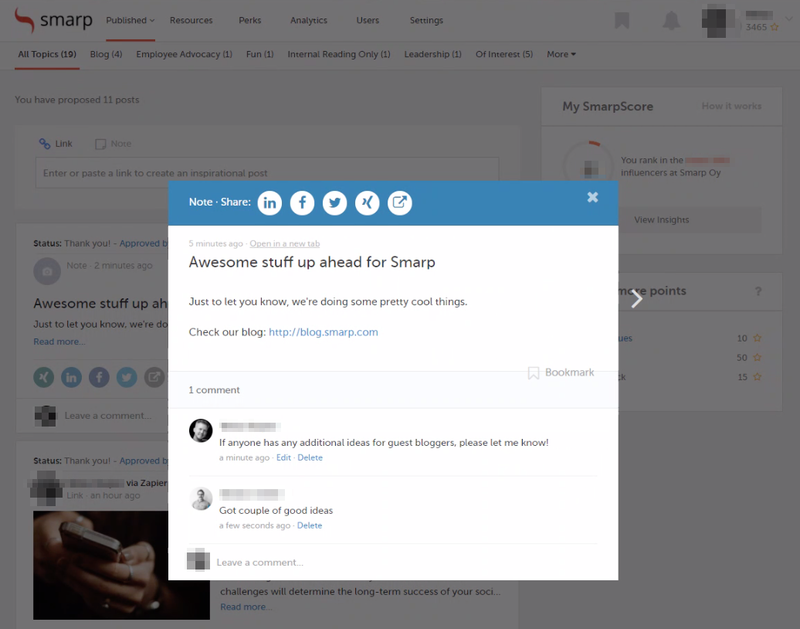 Smarp is an employee collaboration and engagement tool, it helps writers and subject matter experts to access news to find timely, useful information for their content. Users across your company can also easily discuss and share information over social networks. While Smarp is primarily an employee advocacy platform, it’s also great for promoting all types of employee engagement. Team members can post content that they think their peers should consider sharing on social media or that may otherwise be of interest across the organization. Professional content creators and line-of-business team members can discuss concepts and share documents back and forth to assist with content strategy, angles and turns of phrase. Internal stakeholders across business units can also share and pull information from the company’s news feed. The real-time feed gives employees an endless supply of potential content ideas to share on social media. Slack is a great file sharing and instant messaging tool, which is used by thousands of renowned companies, including Time Inc., AirBNB and Pandora. It can be a great tool for content marketing teams as well. You can easily setup an account with Slack. After that, you can begin a content marketing project by creating a channel for it. Make sure both content marketers and subject matter experts are added to each channel. 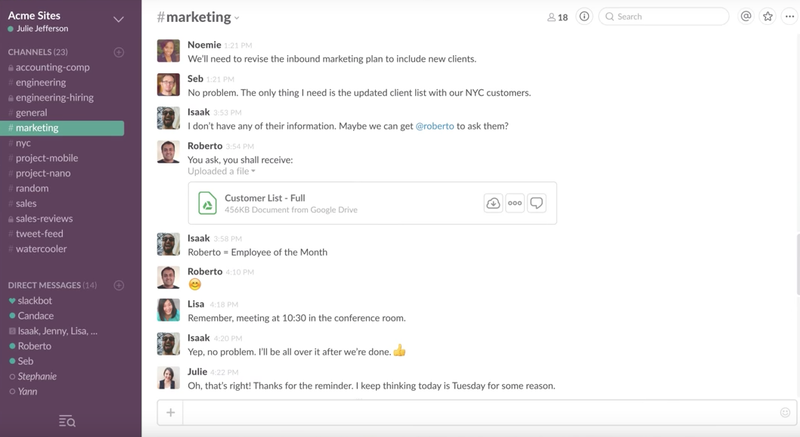 Subject matter experts and writers can use Slack channels to shares notes and files with each other. You can create a to-do list asking the subject matter experts to provide important information to the writers or share a draft. Slack automatically saves archives of all files shared for easy retrieval whenever needed, and there’s a vibrant ecosystem of installable bots that can help automate workflows, streamline social sharing functionality and track performance data. 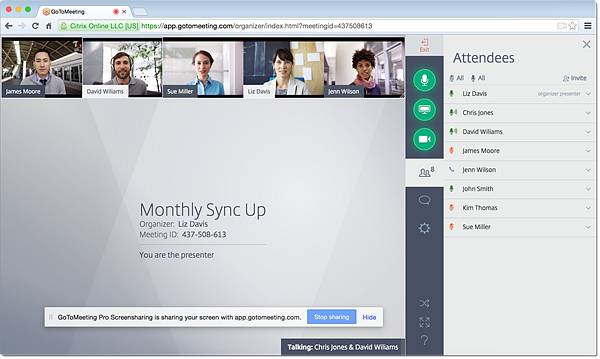 GotoMeeting is a screen sharing and video conferencing tool, which is available as a web app, native mobile app or desktop client. If writers need to consult with subject matter experts remotely, this tool enables them to engage in real time and get important visuals. Open communication is important – keep in mind that subject matter experts and writers often spend their days operating with different terminologies, so you’ll need to make an effort to get fully aligned. This is where screen sharing comes in especially handy, because content writers can ask subject matter experts for questions and get answers on the spot, along with visual demonstrations. Share screens with each other in real-time. Record video meetings, which helps for future transcription. Share files to provide clarifications. Schedule meetings and sync calendars. GotoMeeting is a great platform for collaborating on complex projects, worth consideration for all content marketing teams. Some brands have more informed audiences than others – if you need your content to reach a large B2B audience via social media, for example, then you need to meet high standards of niche-specific authenticity. Freelance writers can’t usually write content that will impress niche readers, subject matter experts are better suited to do this, provided they have decent writing capabilities. Social content also needs to have a level of emotion to be resonant, and subject matter experts have dedicated their lives to their craft, so they’re better placed to be able to write something that really grips readers.